(1) Superpages are back. These pages contain all content in all topics for a Chapter on one (sometimes large) page. They are dynamically generated from the current topic pages, which means they always contain the latest content. Currently, they are available for the Adrenal gland, Ampulla, Appendix, CD Markers and Stains chapters. The link is at the end of the standard Table of Contents. As we convert each chapter to our new format, we will add a Superpage link. (2) In February 2016, we had an average of 23,854 visits per day and total page views of 2,702,494, both new records. The daily average is an increase of 15% from February 2015. The top five most popular chapters visited were (page views are in parenthesis) Stains (24,102), Soft tissue (17,696), Skin-tumor non melanocytic (16,941), Ovary tumor (13,603) and Uterus (12,696). Thanks again for using our website! (3) We currently have a whopping 4,732 followers on Twitter! Are you one of them? 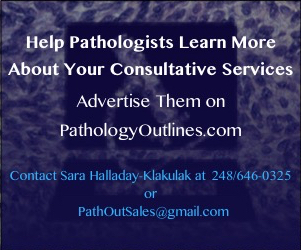 Please follow us: @Pathoutlines. We regularly post interesting cases, news and other information on it. Visit our Blog and Subscribe to our Posts or Follow by Email (click on the box on the right side) to see recent updates to the website. Contact us with any questions at CommentsPathout@gmail.com or at 248/646-0325. 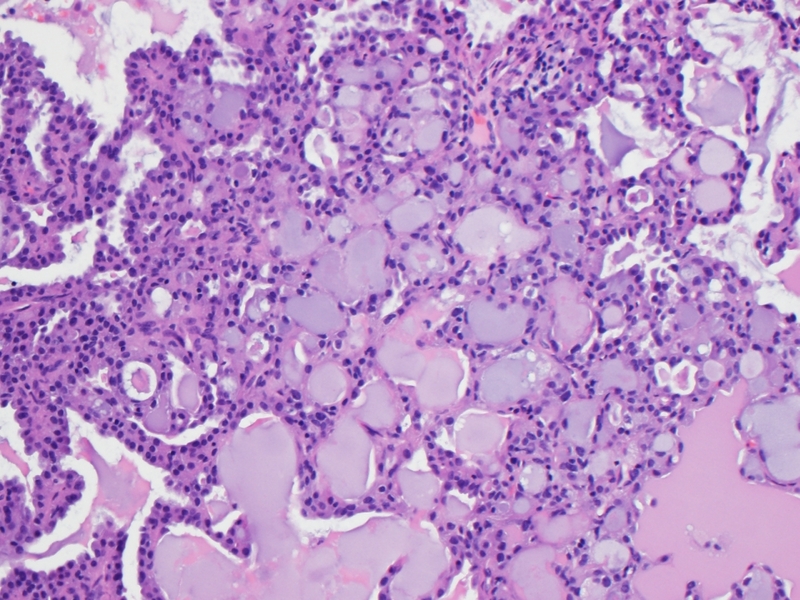 A 39 year old woman presented with a cystic 4.7 cm submandibular gland mass. 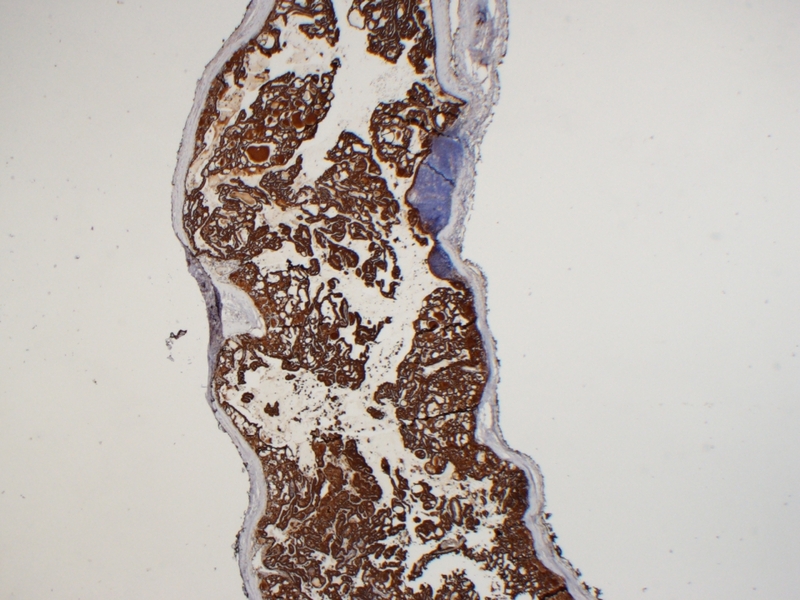 Mammary analogue secretory carcinoma (MASC) is a recently described salivary gland neoplasm characterized by its morphologic, immunophenotypic and molecular similarities to secretory carcinoma of the breast (Head Neck Pathol 2013;7:35). The vast majority arise in the parotid gland, and usually present as a slow growing, painless mass (Am J Surg Pathol 2010;34:599). MASC generally occurs in adults with mean age 47 years old, and there is a slight male predominance. On gross examination, MASCs tend to be solitary and unencapsulated but well circumscribed. They may have a cystic component. 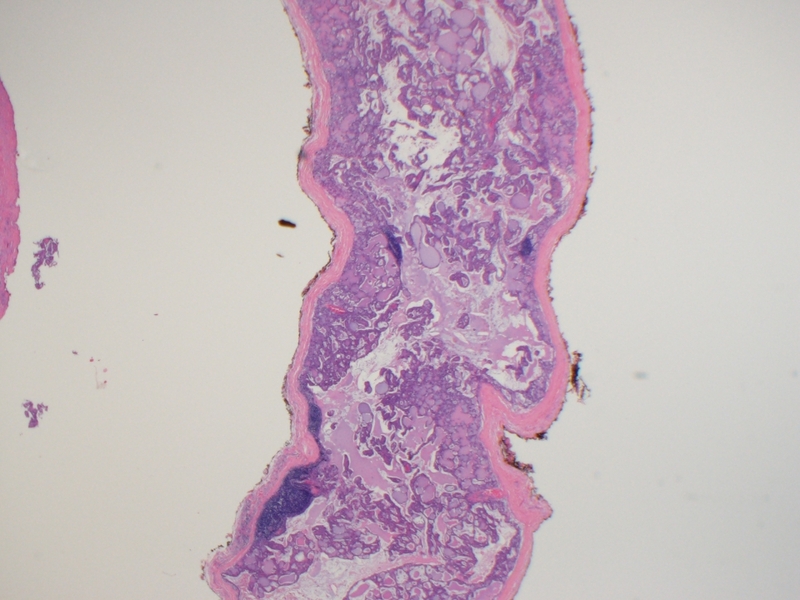 The average size is 1.7 cm, and those arising in the oral cavity tend to be smaller (Head Neck Pathol 2013;7:35). 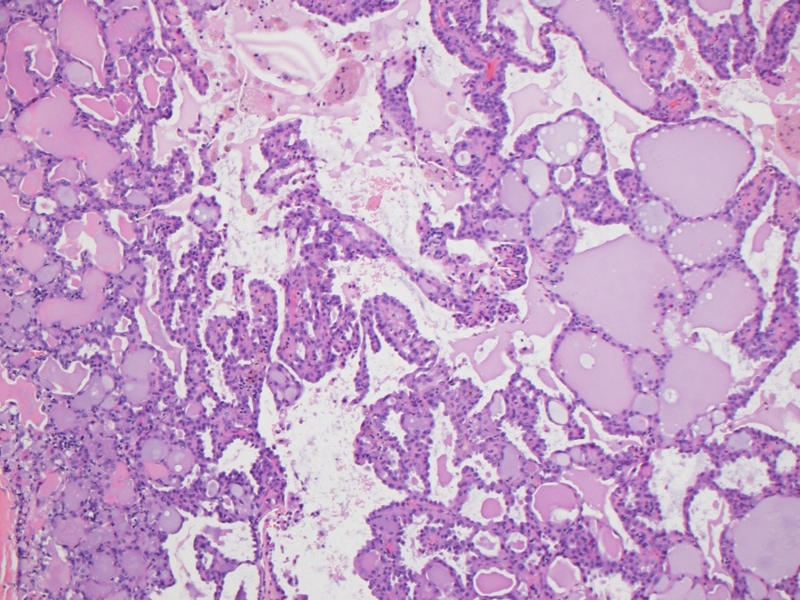 Histopathology shows variable architecture, with back to back tubules, papillae or microcysts. 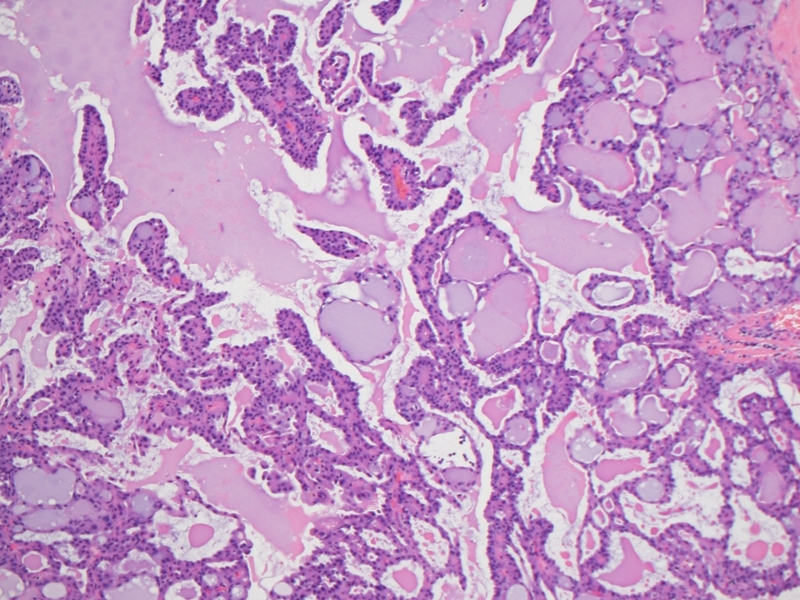 Secretions vary from light pink and frothy to brightly eosinophilic and colloid-like (Head Neck Pathol 2013;7:35). 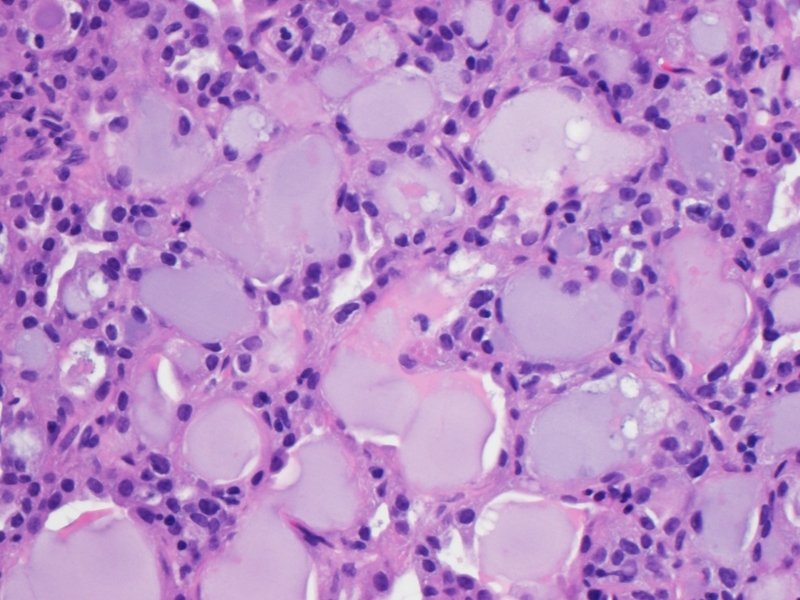 The tumor cells demonstrate granular, vacuolated eosinophilic cytoplasm and low grade nuclei (Am J Surg Pathol 2012;36:27). Mitotic rate is low and necrosis is absent. The cells are immunoreactive for S100, CK7 and mammoglobin. SMA and calponin are consistently negative, and, like secretory breast cancer, MASC is negative for ER and PR (Head Neck Pathol 2013;7:35). Both MASCs and secretory carcinoma have the t(12;15)(p13;q25), leading to a ETV6-NTRK3 fusion oncogene (Am J Surg Pathol 2012;36:27). 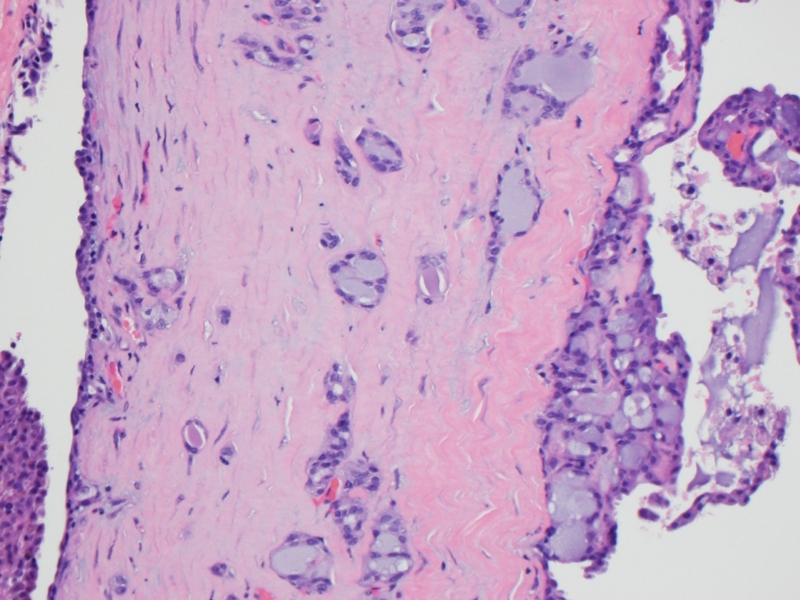 The most important differential diagnostic considerations are acinic cell carcinoma (AciCC), low grade cribriform cystadenocarcinoma and low grade mucoepidermoid carcinoma (Head Neck Pathol 2013;7 Suppl 1:S30, Am J Surg Pathol 2012;36:27). 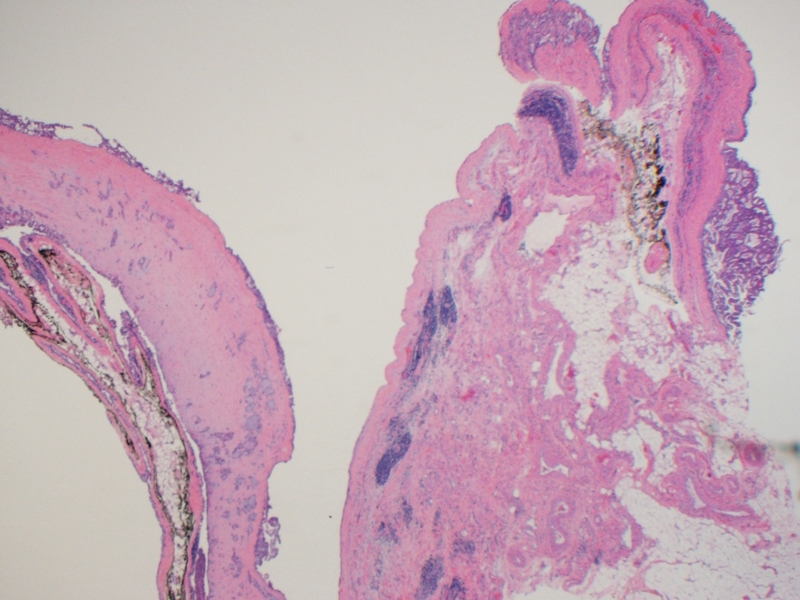 In contrast to AciCC, the cells of MASC are devoid of PAS+ secretory zymogen granules (Head Neck Pathol 2013;7 Suppl 1:S30). Molecular testing is now recommended to diagnose MASC (Head Neck Pathol 2013;7 Suppl 1:S30). 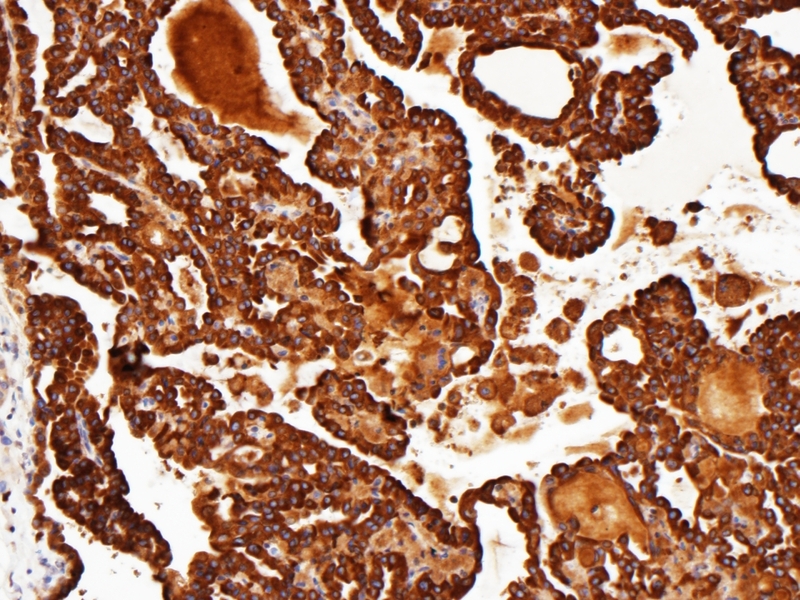 MASC is currently regarded as a low grade carcinoma with overall favorable prognosis, though the limited number of cases with complete clinical follow up data precludes exact assessment of its behavior. Potential for regional lymph node metastasis has been demonstrated. The tumor may recur locally, and in these cases adjuvant radiotherapy is recommended. High grade transformation has been reported, leading to metastasis and death (Virchows Arch 2015;466:245).